Looking to buy a fixer-upper? Want tips on how to make your house have Curb Appeal? 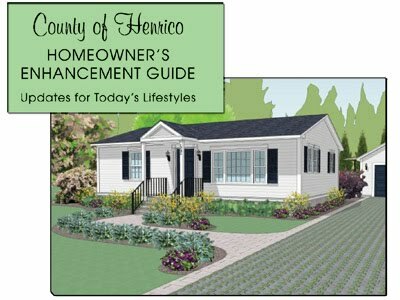 The Homeowner's Enhancement Guide is for homeowners and prospective purchasers of older homes -- residences that may be in need of modernization and enhancement to the appearance of the house and/or property. Elements of the guide are of value for new homeowners as well. By enhancing the appearance of your property, you can increase your property value and contribute to the desirability of your neighborhood, making it easier to sell your home, when the time comes. To find the guide, view and print it out for free at www.co.henrico.va.us/departments/revit/ ; OR check out a copy at any Henrico County Public Library; OR purchase a hard copy for $10 at Henrico Libraries, the Permit Centers (Eastern and Western Henrico Administration Buildings); OR pick one up at the Department of Community Revitalization; OR call 501-7280. A copy can be mailed to you for an additional $5 shipping charge. Remember, improvements you make to your home may be eligible for the Residential Investment Tax abatement program (see above).